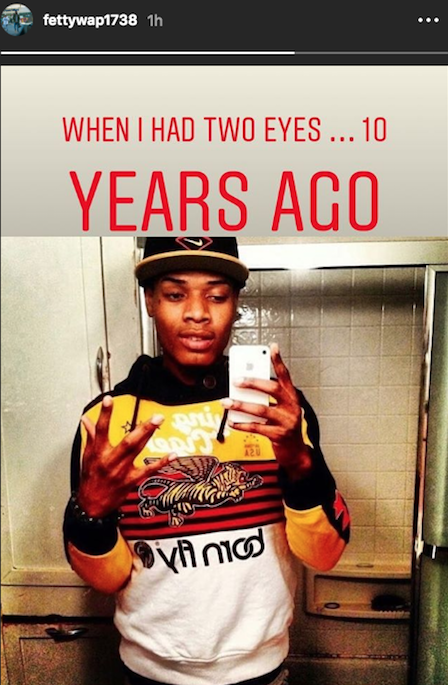 Fetty Wap’s look is a very unique one. When you think the New Jersey singer, you likely picture his signature one-eyed facial features. While he absolutely didn’t lose an eye by choice, the recording artist’s brand prited from his look, boosting him by presenting him as a talented figure with a sense novelty. Fetty has capitalized on people’s fascination with his look too as it has become an essential part his presentation. During the “My Way” and “Trap Queen” days, fans became enamored with Fetty for his unique sound and one–a-kind appearance. Digging deep into the photo album, the rapper found a photo himself before he lost an eye to glaucoma. Becoming a part his signature look, it’s definitely a little odd to see Fetty with two eyes. We’ve become so used to his now recognizable features that it throws us f.
It appears, Fetty Wap’s ex girlfriend Lezhae Zeona has given birth to a healthy baby boy on Saturday. Zeona showed f the pregnancy on her Snapchat, as seen below. The newborn is said to weigh “six pounds, 12 ounces.” This is their second child together, they also have a daughter named Zaviera to their credit. In January, Fetty and reality star Alexis Skyy welcomed a premature child to the world. The newborn was placed in an incubator where her condition has steadily improved. That brings his baby count to: 2 in 2 months, and 7 overall. The players involved have not played nicely with another, and it’s been up to Fetty Wap to keep the peace in his ever growing camp. Zeona and Skyy have been pretty much at war with each other. Even Fetty’s other baby mom Masika Kalysha took a few running shots, suggesting Zeona and Skyy were destined for single parenthood, ouch. All in all, Fetty is probably in over his head, I hope he has just as much as fun raising his child as you would expect. Does that ‘1738’ come with a love seat?